Last Saturday, I went to Multnomah County Library’s used book sale to pick up some cheap books (while helping out the library!). I snagged some books I was missing from my collection, like LIAR & SPY and THE AMULET OF SAMARKAND. I also got a book of crockpot recipes, some animated movie soundtracks, and a book of urban legend comics. But I also picked up a couple of poetry books, and one of them was the exact same book I used to read to my students, back when I worked in after-school programs. The tough thing about the after-school program I used to work in was that we had kids ranging from age 5 to age 10 and 11. That’s a big range. While the older kids spent the bulk of their after school time doing homework, I had to have activities that would appeal to all these ages. (It was really hard.) One thing I did with the kids was read to them during snack time, when their mouths were full and they were most likely to be listening and attentive. I had a great idea upon seeing the cover. I checked out the book and brought it to the snack table the next day. 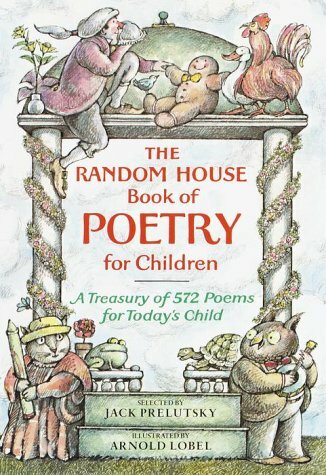 To my surprise, the kids did not seem very excited about the poems, until I began asking them to pick a page number from the book (I gave them a range of numbers). After that, I’d count up the poems on the page and have another kid pick a number between, say, 1 and 6. Then I’d read that poem. Doing that, I think, made the kids who picked the numbers more invested in the poem. They wanted to see if the page or poem that they picked would be good. We never did get through all 572 poems. After a few weeks the kids wanted something more structured and fictional, so I read them MATILDA. But hey – it did work for a few weeks. In any case, I look forward to reading all the poems in this book. Maybe randomly, or maybe in order. Who knows?